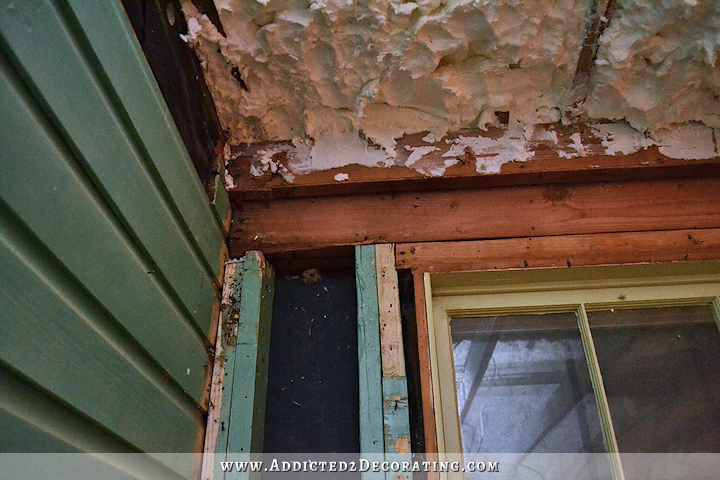 I’m pretty sure every DIYer who buys an old fixer upper house and starts tearing into the walls, floors, and ceilings, has as least one (but probably a few) of those what the heck were they thinking?! moments. 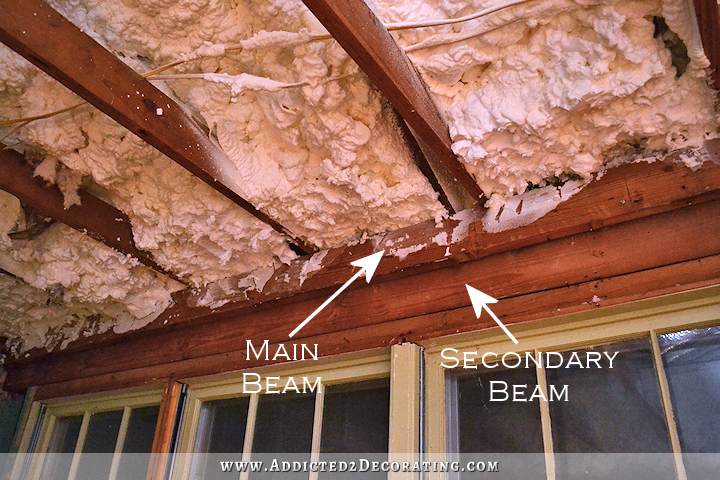 And by “they,” of course I mean previous owners who made modifications to the house. I’ve had several of those moments regarding the wiring in this house — open junctions in the attic, wads of wiring hooked together in very unsafe ways, etc. I also had one of those moments when I discovered that someone had just cut right through a ceiling joist in the hallway to install the large intake duct for the old furnace. Seriously. I’m not exaggerating in the least. I’m still working on getting all of this old wood off of the walls and getting down to the studs in the breakfast room. (I’ve finished that in the pantry area.) And here’s the wall in question. Now remember, this room used to be an open breezeway between the house (kitchen) and the garage. It did have the roof on it, but there was no wall of windows. It was completely open on the front and back. And since there was a roof, something had to hold that roof structure up, right? That means that this front wall is (and has always been) absolutely load-bearing. I mean, that’s obvious since it’s an exterior wall. But I mean it’s REALLY load-bearing since the roof trusses rest directly on this wall. This wall is literally holding up the roof. So I expected there to be quite a bit of support in this wall, like perhaps I’d see the main load-bearing beam resting directly on top of some really strong side walls or something. Well, let’s take a look at what I found. First of all, here’s the main load-bearing beam. I can’t tell if it’s made of two or three 2″ x 6″ pieces of lumber, but it’s at least 2 boards thick, so that’s good. And you can see that the trusses rest directly on top of that beam. Just below that, there’s a secondary beam made up of two 2″ x 6″ pieces of lumber. Now the curious thing here is that the main beam overhangs the secondary beam by one board thickness. That’s why I’m wondering if (hoping and praying, actually) the main beam is made of three 2″ x 6″ pieces of lumber, while the secondary beam is only made up of two. If that’s not the case, then I have absolutely no idea why they’re staggered like that. So while it’s definitely not done by today’s standards (having two beams instead of one really wide beam is very unusual), it’s still clearly a lot of strong wood holding up those trusses. But those beams are only as strong as the vertical support holding them up. I expected the top beam to be resting on top of side walls. That wasn’t the case. 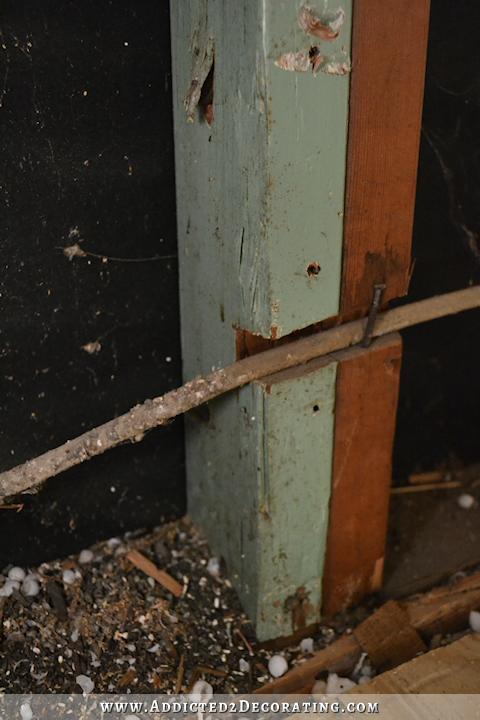 In fact, both beams on the left side of the wall are just butted right up against the garage wall with some nails toenailed into the garage wall. That still wouldn’t be a reason to panic as long as there are plenty of supporting vertical studs holding up those beams. So let’s take a look at what I found. First of all, on the left side of the wall, there are no studs making contact with the main beam at all. None. They’re all contacting the secondary beam only. That’s concerning to me. There are a total of four vertical 2 x 4’s on this side of the wall. The first one isn’t even touching the beam. There’s about a one-inch gap between the “stud” and the beam that’s filled with lizard eggs. The second 2 x 4 isn’t even a whole board. It’s about 16 inches long and nailed to the first board. So while it’s touching the beam, it’s certainly not structural. The third 2 x 4 is structural. It’s making contact with the beam and the base plate. And the fourth 2 x 4 is actually pieced together to serve as a frame for the windows, so it doesn’t count either. So this entire side of the wall literally has one 2 x 4 stud holding it up. ONE STUD. That’s it. Nothing else. Just one measly 2 x 4 structural stud holding up the entire weight of this end of a 12-foot VERY load-bearing wall. Again, holy crap. Nope. Nada. In fact, if I put pressure on the bottom of those windows, all three of them move quite freely. There’s nothing connecting them to the wall framing on the bottom or sides. 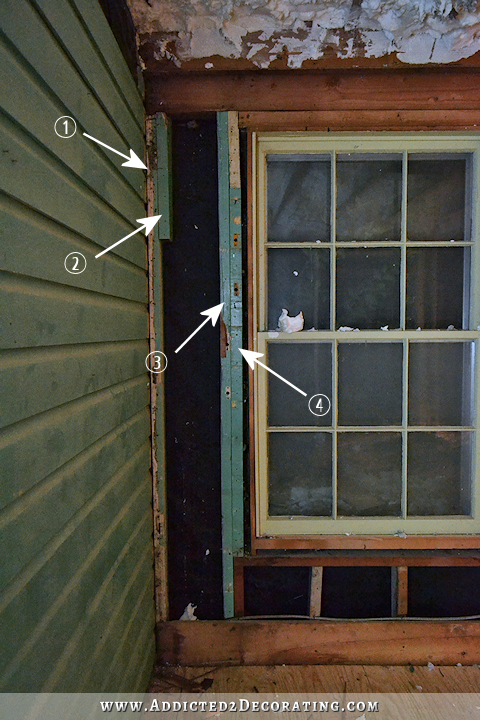 They’re literally just kind of dangling in place from some nails nailed through the tops of the window frames and into the wall framing, and they’re mostly being held into place by the siding on the outside of the wall. So nothing at all in this 9.5-foot span is carrying any weight. The right side of the wall was a bit better. Not much, but just a bit. It had four vertical 2 x 4’s also. 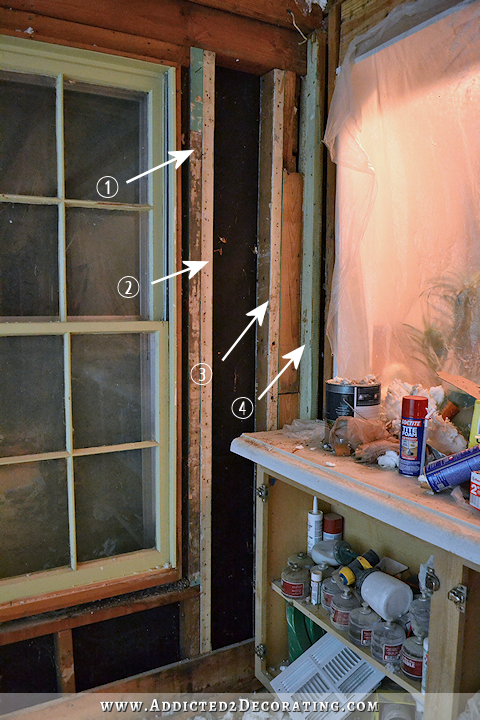 The first one is pieced together as part of the window framing, so it doesn’t really count. The second one is actually structural, reaching from the base plate to the secondary beam. And the third one is also! And then that fourth one is actually structural AND it’s touching the main beam! That’s the only 2 x 4 on this entire 12-foot wall that’s making contact with the main load-bearing beam. So the right side of the wall is at least better. Not good, but better. But the left side seriously freaks me out. This is absolutely the most frightening thing I’ve found in this house…so far. This makes me way more nervous than the wads of wiring with open junctions in the attic. Those may not have been in junction boxes like they were supposed to be, but at least those were covered with wire nuts and electrical tape. But this? Well, this is just frightening to me. The sooner I can get this wall shored up with lots and lots of support, the sooner I’ll be able to rest easy. After taking off the last board on this wall, I realized that it had even more problems (if that can be believed)!! First off, the one and only structural stud on the left side of the wall had a notch cut out of it for an electrical cord. That notch is cut about one inch into the stud. You never, ever, ever cut into the edge of a structural stud. If you need to put an electrical wire through it, drill a hole through the middle, but leave the edges intact. And then when I pressed up against the wall, I noticed that the entire base plate moved back and forth. In other words, the base plate on this entire wall isn’t even attached to the foundation below it! You know, there was a time not too long ago that I planned to just leave all of the wood on the walls and drywall right over it. Thank goodness I changed my mind, or I never would have found these problems! Now that I know they’re there, I can get them fixed right up, and this room will be as solid and secure as the rest of them. you will get it done and it will be done perfectly!! Don’t worry, you will do a great job!! Oh my. Good thing you started on this area. Maybe this is part of what was creating your angst – something was very wrong on some level but you didn’t know what it was. Can I just say, “O.M.G.”? I could hardly breath as I read this expecting the wall to collapse at any moment. If it stood this long it will stand long enough for it to be fixed. Kristi, you are an amazing woman who has faced many challenges and this looks like a big one. Praying that you will get lots of support for this one. Wow! Good thing you found it now. I echo Sandy’s comment and prayer for support. Maybe “your guys” will be able to help quickly! Kinda makes one wonder what else may be dangerously wrong. Have you ever considered having a structural engineer take a look at the house? I know it’s an expense no one wants to put out, but with what has been found so far, I think it could be money well spent for your safety and Matts. In our area, they run about $300 – 700 to do an inspection only. Please be careful! You don’t want a beam cracking you in the head! Or worse. If I were completely confused about what needed to happen, I’d consider calling in a structural engineer. But this house is very basic construction, and I understand basic wall construction. As I’ve torn each room down to the studs, I’ve inspected the framing and replaced studs as needed. So far in the other rooms, I haven’t seen anything startling at all. There were some things that weren’t quite up to par, so they were corrected, but they weren’t things that were outright scary. My thought too as I was reading Kristi’s description of the mess she found. 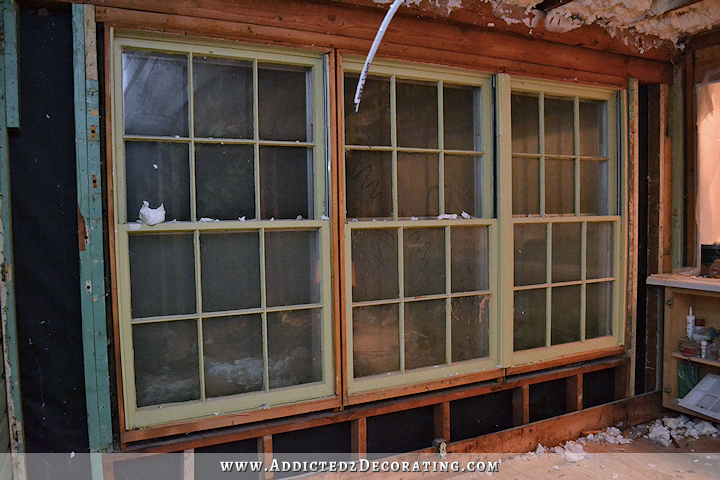 Amazing that a bad storm didn’t take out those front windows and wall – using that term loosely, of course! At least you now know what you have to do to make this right and safe. The house was originally built by carpenters & this room probably by Joe Homeowner who was probably trying to save a buck. They most likely thought since the roof is there we just need to close the 2 ends up & we have a room ! The roof just hung there by itself so why worry about support ? Luckily this is the only homemade room you have to deal with since you’re going to tear the sunroom down. 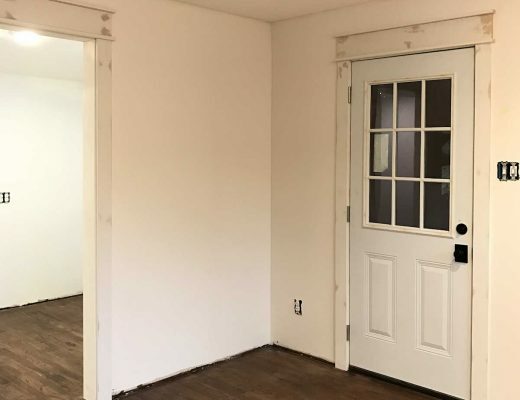 Seriously though, I’m thinking that if this was an open breezeway–more or less like a carport, that outside wall probably wasn’t originally structural. If the roof was already there, it would have been a reasonable assumption that the roof was designed to hold itself up without further support. Although clearly, it wasn’t if it’s more or less just toenailed into the sides. Also, if they were going to put in an outside wall, why not at the very least use proper jack studs on the outside of the wall and near the windows. And since the new roof more or less rests on this one, you’d think they’d want a little extra support. If your house were up north, you probably would have had cracked windows by now from the weight of snow on the roof, at minimum. The good news is that at least you opened it up and have the opportunity to fix it. It’d be awful if you spent the money replacing the windows and doing all the finishings and then the new windows cracked or stuff started caving-in. Good thing you know what you are doing!! Obviously those that did the patch work of before didn’t have a clue! I know this house is so thankful to have you aiding its recovery!!! In a previous home I owned ( it was about 100 years old) we discover during a kitchen renovation that the cement holding up the outside wall, in a 2 story house, had completely disintegrated! When I asked the contractor what he thought could possibly be holding the house up, he said “habit”!!! So don’t panic, lots of older places are like that, and rarely fall down! It’s nice that you’ll be able to fix this though, and since it used to be a breezeway, I doubt very much that problem exists anywhere else in the house! Yikes! Be careful as you shore it up. I think you’re underestimating the power of a lizard mama, she’s probably in the wall somewhere holding that beam away from her eggs! Good thing you went that deep into the wall. I agree that a quick look over from a structural engineer or at least the an inspection by the city building department would be in order before you close it up. Your progress is inspiring. Keep at it, it will be beautiful (and safe) when you’re done! You had me almost snorting my coffee up my nose with “the power of a lizard mama”! I had a sudden mental image of a lizard wearing an apron and red lipstick and a look of fierce determination, in a pose mimicking Atlas holding the world on his shoulders, straining to hold the roof of her world up to save her little eggs from death and destruction! Wow! It must be a “Kim” thing, because that’s the exact same image I got, except the lipstick was pink and she was wearing a pair of heels but no apron, and had bulging muscles! Same look of determination, same pose! Even with a structural engineer, closed walls and celings can hold surprises. In my 1870’s home, a cast iron tub was installed in the second floor bathroom (previously a bedroom since … outdoor plumbing). To install the water and drain lines the floor/ceiling joist were cut through beneath this very heavy cast iron tub. 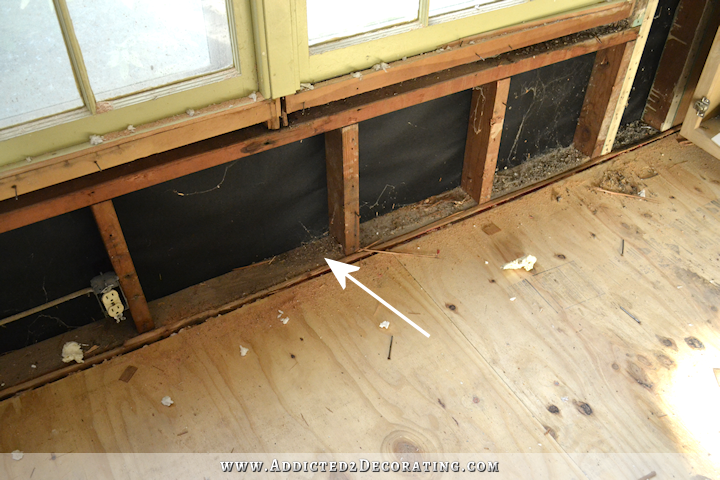 At least half of the joists had been cut away, leaving very little wood supporting the tub and floor. 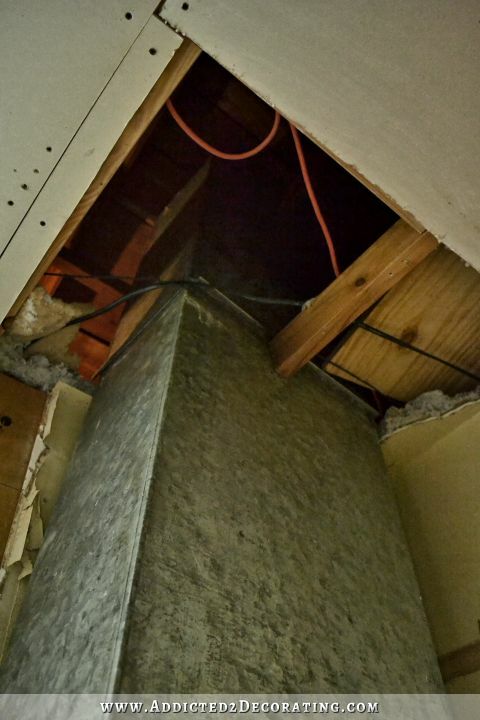 It had compromised the joists to the point that they were sagging into the space above the ceiling tile. It was amazing that the heavy cast iron tub, when filled with the additional weight of water and a bather, hadn’t fallen into the dining room. So Kristi, you’re off to HD for lumber, then to the equipment rental outfit for bottle jacks. You will have this corrected in no time. This really brings back memories. Chicago area farmhouse 150+ years old. 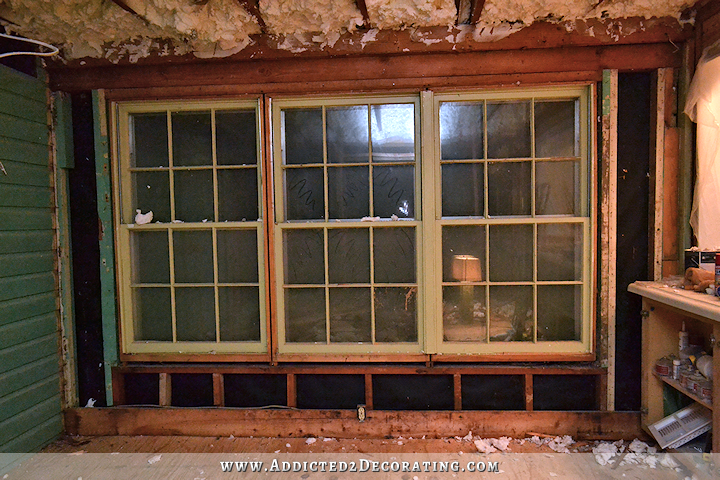 As we tore it apart the “history” of the house was revealed. It began as two rooms down and two up. The successive occupants added on as necessary, a room here (and here, and here), a second floor there, a front porch etc. I discovered that the eating area of the kitchen (approx. 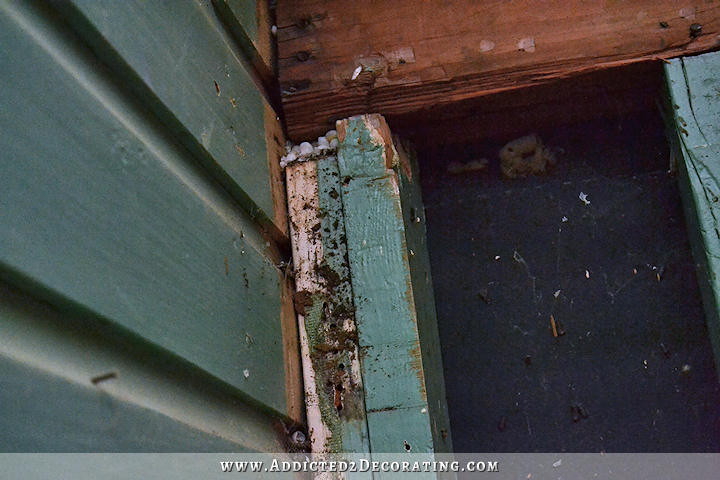 12×12) had joists that were “supported” by an ancient wooden ladder. Yep, the farmer had built a rubble stone “foundation” (thank The Lord he used mortar) and just set an old ladder (trimmed for length) atop the wall, laid his joists and sided with old boards. the important thing is that you discovered this before there is a real issue (an accident where someone is injured!!). My house was built in ’87, newer compared to your home, but we are still amazed at some of the things builders were allowed to get away with, that we have been fixing one at a time as well. Although, mine are all minor compared to this one! At least you know looking at it that it must be fixed. I feel bad for homeowners who have no idea and do renovations and leave things like that in place! When are you getting the new window/s for there? Won’t you need exact dimensions for them before you begin repairing this wall? Not a huge deal, and looking forward to your solutions! OMG! Thank god you found it before someone got hurt! Believe me, I feel your pain- my house has been constructed with tape, superglue and gravity. Every time we open up something to fix or improve, we find yet more terrible things. Very painful to see that someone would do this knowing that people would be trying to live there! I know that you will do a great job, and then it will be a really safe haven. Keep the faith! All I can say is, “Thank God this house found you”. You’ll make it safe and sound. Wouldn’t you like to know who did that? Obviously it was not someone who took out a building permit. Scary. That’s why we have code inspectors. The only looming question remaining after reading all the comments is, “What happened to the lizard eggs?” (grin). Seriously, your brain amazes me. Wow that is totally nuts! Long ago, we too rebuilt our older home, in our old home state. 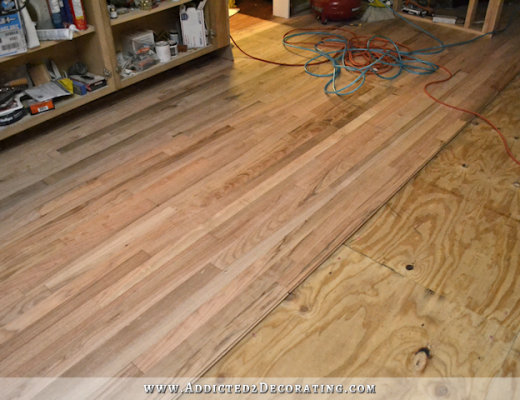 Stripped down to the studs, floor to ceiling, it was ALL replaced with new. This also included upgrading the electric systems, to double the previous capacity.We also built an addition of three bedrooms, and a utility room. THANKFULLY, my husband is fully licensed, and properly educated to do work such as this. But last week, I tried to watch a whole day of the show, “First Time Flippers”. At first it looked okay, but as shows progressed, I could clearly see that the folks involved were neither educated or licensed to do ANY of the work they were doing (including in one episode, the building of a set of stairs). I kept watching just to see WHAT they did, (and not in a good way). The fact that HGTV is getting folks hooked on ‘start flipping’ homes, while having ZERO knowledge of HOW things are not only built, but REQUIRED to be built is just crazy! Just because you know how to use a hammer and screw-gun, doesn’t mean that you can rebuild a home (or room). I was literally in shock at the way some folks were putting homes back together, after they did demo. Now, I kept telling myself that surly HGTV has safety and insurance liabilities, that they MUST adhere to – so I’m fairly faithful that they didn’t just let somebody do something wrong and leave it both wrong and possibly unsafe – not with a ‘HGTV show attached’ to the resale of that house. I can’t imagine that their lawyers would be comfortable with them seeing a blatant safety issue take place, and them just letting them leave it that way. But then I started to wonder — with the massive popularity of ‘house flipping’, I wonder how many people are going into homes, and leaving them (unintentionally) unsafe? How many people get the required permits associated with a demo? Or how many people cut corners to save both money and time — if contractors do this all the time, can you imagine how often it happens with ‘lay people’ that are not familiar with contract work? All I can say is – It’s gotta be a scary house hunting situation out there – if you know they flipped it, ask for to make sure that the permits applied for. If they flipped it, ask who did the work, and if they were qualified. While I am sure that there ARE decent ‘flippers’ out there – never loose sight that they are out to ONLY make money off of that sale – and that safety is not always their first thought! So glad that you found this possible dangerous situation before it led to a possible REALLY BAD DAY for you and Matt! 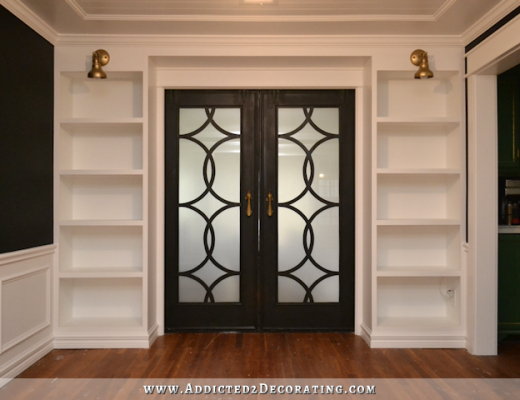 Your work is inspirational as always – I can’t wait to see that pantry!!!! Wow, reminds me when we had an addition built and there was no header over the sliding glass door. That’s how I learned what a header is. But this is worse ….. scary. Speechless about covers it. Oh, and lizard eggs ….can’t even! This is your friendly, blog- reader, former architect here. I think that what you are calling the “secondary beam” is actually the main structural member and is likely a double 2 x 12 with the 2 x 6 scabbed on alongside the top edge form a nailing ledge to help hold and probably making it easier to attach the trusses, or perhaps to help beef-up the structure (though it is a bit unusual, it might have been required by a building inspector later, etc.) The 2 x 6 is likely covering up the top part of the 2 x 12 so you are only seeing the bottom 6″ or so. Since it was originally a breezeway, they probably just used the existing main structural header as the window header, and didn’t frame the windows in the usual way. Was this addition, or the original breezeway permitted? The single stud next to the garage wall is only supporting half roof load between itself and the double studs on that side of the window. What looks like a cut stud next to the single stud is acting like a bracket helping to transfer the load of the beam on to the end stud, and also providing a larger beam “pocket” to support the end of the beam. 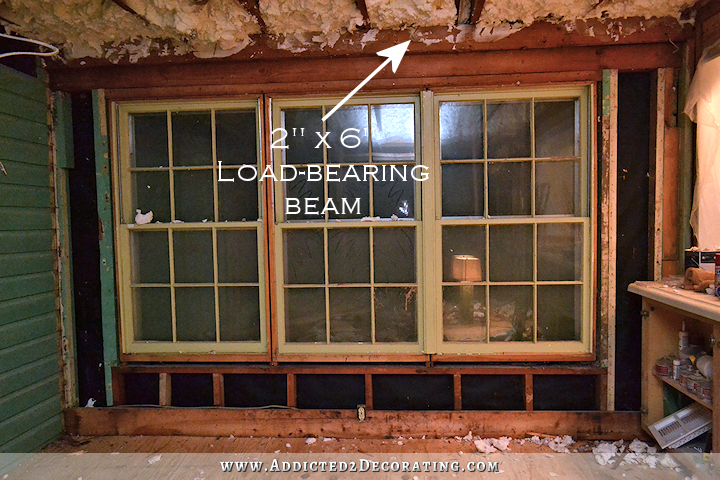 The pair of double studs on either side of the window are probably doing the most to support the beam and roof load. Hope this helps ease your mind. It’s actually two separate beams. I assure you. 🙂 It’s not very clear in a photo, but if you’re looking at them in the room you can clearly see that they’re separate. I’m with Genelle, this house needed a savior, and you’re it! You’ll have it up to par and gorgeous; not without a ton of sweat/work, but you’ll get it accomplished. OH MY GOODNESS ! Just as well you stripped that wood from that wall. You certainly wouldn’t want a fierce wind or storm. Sure hope you can get some quick help with this situation. Please be careful, after this is fixed you will have a beautiful room. Wishing you all the best. Glad you did the uncovering of that area. Oh my goodness is such a mild way to say…YIKES!! I was glad to read what Phyllis had to say. She makes it sound a little better. Keep going you are really turning a beautiful purse out of a sow’s ear. I love to see your bravery and your talents at work. You give me such courage. Building codes?! We don’t need no stinkin’ building codes! You need to do a video on how NOT to frame a room. LOL. I’m confused. Did the breezeway have a roof originally? I don’t know much about this kind of stuff, but I do know that here in PA you don’t buy a house without a home inspection, unless you have more than the required holes in the head. That said,most people who are selling a home, do their own home inspection to make sure nothing gets found that would cost them money when the buyer inspects the home. On to permits. When “whoever” enclosed the breeze way, didn’t they have to pull permits? It seems as thought that would have been major construction. Since you now know that the three swinging windows are not all that secure, would you consider putting in two full length windows, with a center door and a ramp outside. Matt would have less land to cover to get into the house. Glad you roof did not fall down, before you found this problem. Yikes!! !